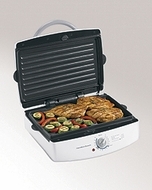 Grill meat, seafood, poultry, and vegetables all year round with this indoor electric grill. The unit provides a large 100-square-inch grilling surface that can accommodate up to six hamburgers. For more room, open the grill up flat to create 200 square inches of cooking space. Most meals cook in 10 minutes, and a removable drip tray is included for low-fat cooking. The grill features an easy-to-use control dial, temperature-ready light, and an auto shutoff timer that turns the power off when the cooking cycle is complete. For added safety and convenience, the unit's handle is cool to the touch and its removable grids are dishwasher-safe for quick cleanup. Size: 16" x 12.5" x 5"